Japanese SMS Cartridges - Development - SMS Power! 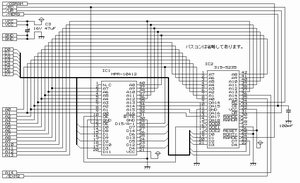 This page provides some basic info about Japanese SMS cartridge's hardware and contains schematics of selected circuit boards. List of games using these boards is not final. This Japanese SMS/Sega Mark III game cartridge board contains 315-5235 mapper chip and two custom 40-pin 16-bit ROM chips (128Kx16) in "byte mode" to make them 512KB in total, unlike it's US and European counterpart which contains only one 8-bit ROM chip (512Kx8). The ROMs have the first and second halves of the data respectively. 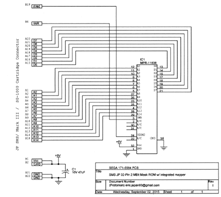 Their CE pins are connected to CE1 and CE2 on the 315-5235 to enable them, rather than CE0. This Japanese SMS/Sega Mark III game cartridge board is used exclusively for Phantasy Star and contains 315-5235 mapper chip, one 32-pin 8-bit ROM chip (512Kx8), one 28-pin 64Kbit S-RAM chip with 3 volt CR2032 lithium backup battery and a 3-pin TO-92 package monolithic IC PST529 as control circuit for the battery-backed up memory. 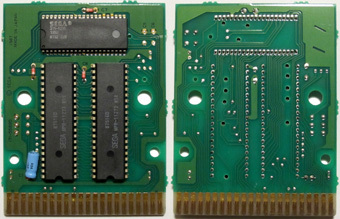 This Japanese SMS/Sega Mark III game cartridge board contains a single custom 32-pin 8-bit ROM chip (256Kx8) with integrated mapper logic. 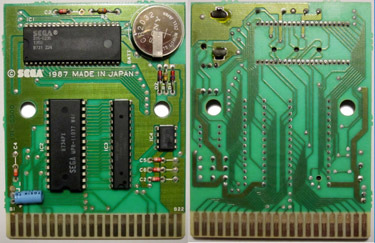 This Japanese SMS/Sega Mark III game cartridge board contains a single custom 28-pin 8-bit ROM chip (128Kx8) with integrated mapper logic. 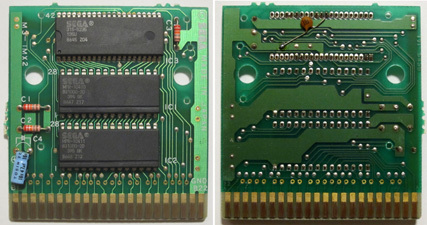 This Japanese SMS/Sega Mark III game cartridge board is used exclusively for Doki Doki Penguin Land - Uchuu Daiboken and contains 315-5235 mapper chip, one custom 28-pin 8-bit ROM chip (128Kx8), one 28-pin 64Kbit S-RAM chip with 3 volt CR2032 lithium backup battery and an 8-pin Fujitsu MB3771 power supply monitor IC for the battery-backed up memory. 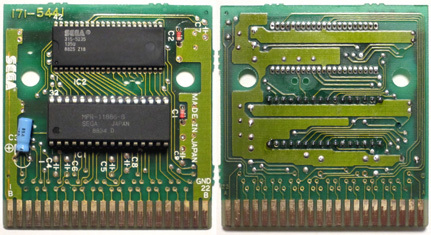 This Japanese SMS/Sega Mark III game cartridge board is used exclusively for Nekkyuu Koshien and contains 315-5235 mapper chip and one 32-pin 8-bit ROM chip (256Kx8). 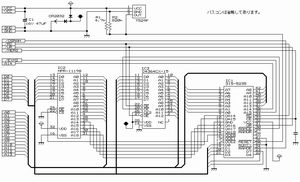 This Japanese SMS/Sega Mark III game cartridge board is confirmed to be used only for Rocky and some versions of SpaceHarrier and OutRun and contains 315-5208 mapper chip and one custom 40-pin 16-bit ROM chip (128Kx16). 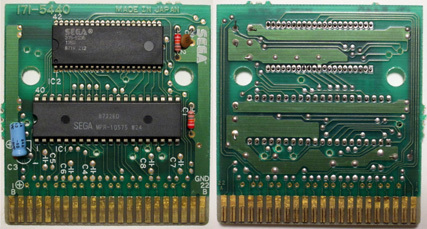 This Japanese SMS/Sega Mark III game cartridge board has two known board versions. 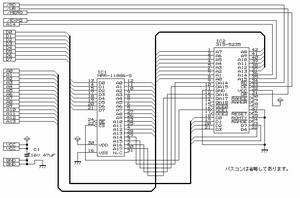 The first one contains 315-5235 mapper chip and two custom 28-pin 8-bit ROM chips (128Kx8). The ROMs have the first and second halves of the data respectively. 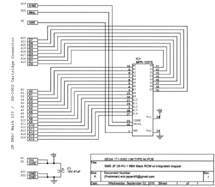 Their CE pins are connected to CE1 and CE2 on the 315-5235 to enable them, rather than CE0. 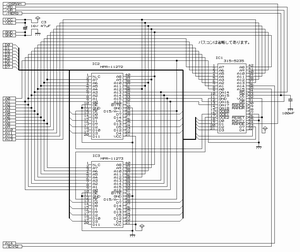 The second version contains board number 171-5440 with 315-5235 mapper chip and one custom 40-pin 16-bit ROM chip (128Kx16). This Japanese SMS/Sega Mark III game cartridge of Fantasy Zone has two known board versions. 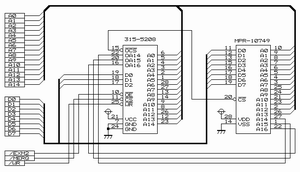 The first one contains 315-5208 mapper chip and one custom 28-pin 8-bit ROM chip (128Kx8). 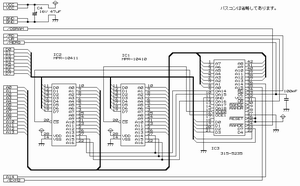 The second version contains board number 171-5362 and one custom 28-pin 8-bit ROM chip (128Kx8) with integrated mapper. 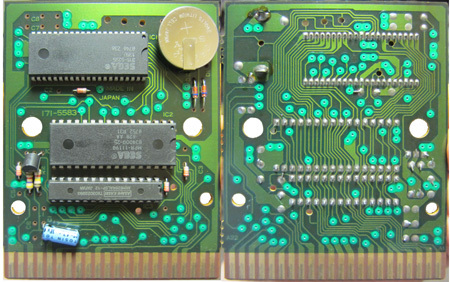 This Japanese SMS/Sega Mark III game cartridge board contains 315-5208 mapper chip and one custom 28-pin 8-bit ROM chip (128Kx8). The board is a minor revision of the original 171-5363 removing the two additional diodes and capacitor and modifying the circuit traces.